COVER ARTIST KENT WALSH is the living, breathing manifestation of her abstract paintings: enthusiastic, vivid, exuberant, passionate, energetic … bold. 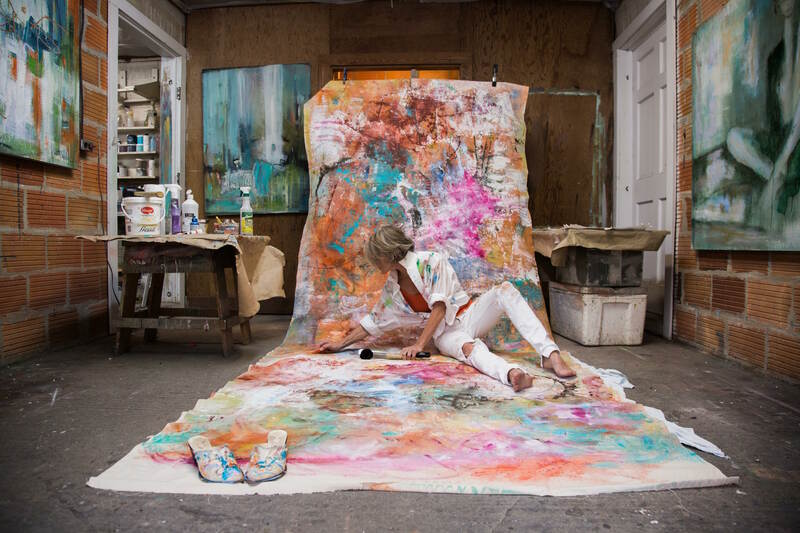 The petite blonde has anything but a dainty artistic talent, and her large-scale canvases display an expert command over color, artistry and composition. The Alabama native was born in Birmingham, raised in Mobile and now resides in Point Clear, Alabama, where she has lived for the past 14 years. Walsh is clearly devoted to her students and to teaching what she loves. “Most people want to take classes in abstract expressionism, and they think it’s going to be easy. I teach a regular abstract class once a week, here in Point Clear. My students tell me, ‘I can do that!’ But then they get frustrated, because it’s not as easy as it looks. We have a really good time, but we work really hard. I’ll set out a still life for my students, but I never make it a pretty one. I want them to look at the lines, at the shapes and at the negative shapes and not just look at the still life … at the bowl of fruit. I ask my students to really push themselves, and by the end of the day, everyone is exhausted. They’re ready to ‘throw in the brush!’” Walsh laughs as she talks fondly about her classes. The exact emotional reaction of observers of Walsh’s work may be unpredictable, but certainly, collectors and viewers alike will be left breathless by her remarkable paintings. Walsh’s paintings are mixed media, mostly acrylic or oil with charcoal, oil pastel and various other media. Her canvases are large, typically 3’ x 3’ or 4’ x 4’. Her work can be found locally at The French Mix by Jennifer Dicerbo Interiors in Covington, Louisiana. In addition, her work can be seen through her website, kentwalshartist.com, or by calling 251-929-2576 or 251-605-2297. Walsh offers classes and workshops out of her studio in Point Clear, Alabama, or call to make arrangements in a different city or location.